Guatemala, where part of my family lives, has suffered more in recent weeks than many regions ever do. First it was the Pacaya volcano, which is about 15 miles from my family’s home in Guatemala City, the capital. 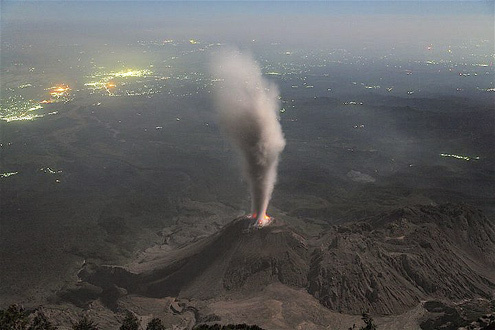 On May 27, Pacaya began erupting, blanketing the region with ash. Three children disappeared, and a television reporter, Anibal Arachila (left), died when he got too close to the volcano and was hit by a fiery shower of rocks. At least 1,600 people living in rural villages near the volcano had to be evacuated. 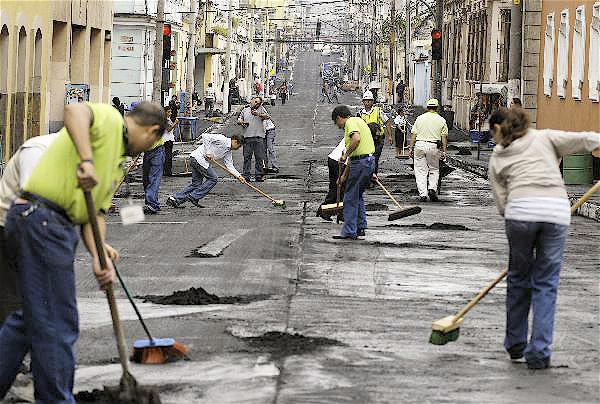 Workers sweep ash off Guatemala City streets. Ash closed the international airport, and two to three inches piled up in streets of the capital, as well as on cars and buildings. “It was amazing walking through the streets covered with a black sand — like that at the seaport,” my former wife Ana Carolina wrote me a day after the eruptions began. 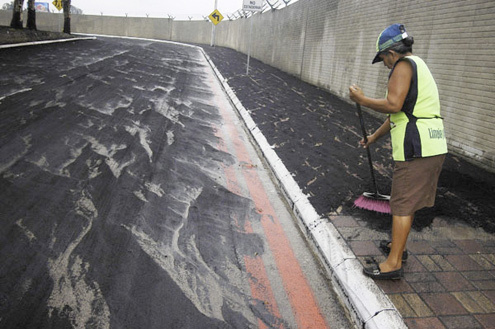 A worker cleans ash off a sidewalk in the capital. Outside her house, Ana Carolina added, “there are bags and bags of ash — which are supposed to be picked up — on the pavement. We are so tired of cleaning the walkway to the house, and we haven’t cleaned the sidewalk around it. 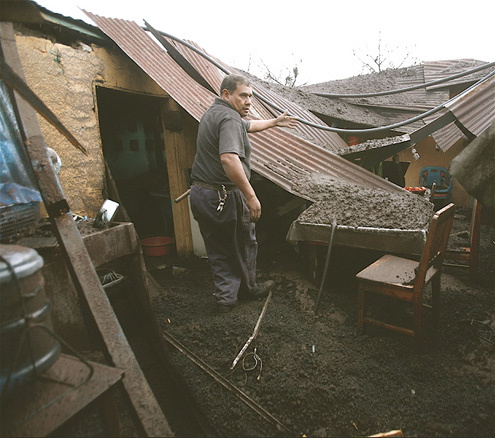 In a rural area outside Guatemala City, a villager examines his home’s roof, which collapsed from the weight of falling ash. Guatemala’s second disaster came in the form of Tropical Storm Agatha, which struck the country only two days after Pacaya began erupting. At least 123 Guatemalans died from flooding and mudslides when the storm dumped more than three feet of rain on the country. An additional 23 people died in neighboring El Salvador and Honduras. 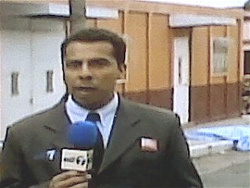 In Guatemala City, thousands of residents had to be evacuated because of the storm. Particularly dramatic storm damage in Guatemala City. 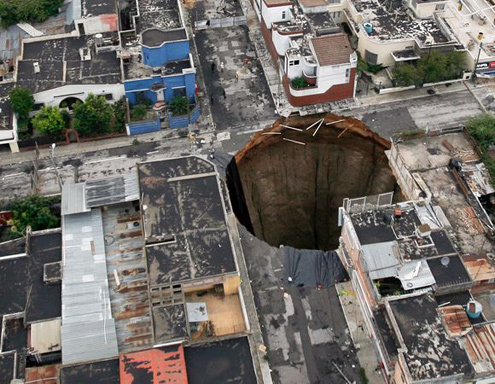 A sink hole 66 feet wide and roughly 300 feet deep opened up under a downtown intersection. A home and a three-story building, in which there was a security guard, dropped into it. 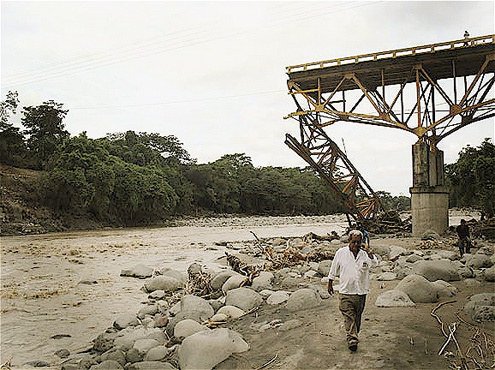 One of hundreds of collapsed bridges that have reduced travel in parts of Guatemala. “Over 300 bridges have fallen down from all the rain,” Shaili wrote, “and it’s mostly because people [in charge of building them] are corrupt. Instead of using all the money for construction, they steal most of it and then they build mediocre bridges and roads. So there are many blockages around the country. “Many people are homeless,” she added. Because Shaili is in her final year of high school, she is taking part in a year-long Seminario, which has unexpectedly ended up helping disaster victims. “The third and last phase [of the Seminario] is called the ‘Investigation-action project,'” she explained, “and it is the most fun of the three. 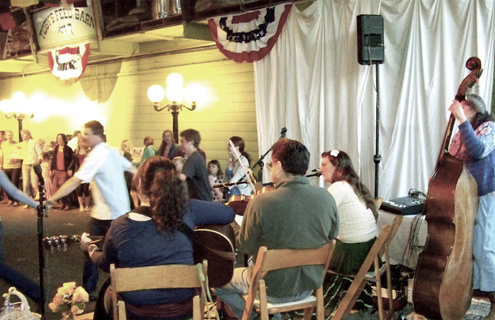 With the group you worked with during the second phase, you have to find a place to help. Usually it’s a public school. “You go to the public school, making several visits. The first is a diagnosis, in which you detect which problem is the most important to deal with. On the other visits, you fix that problem. 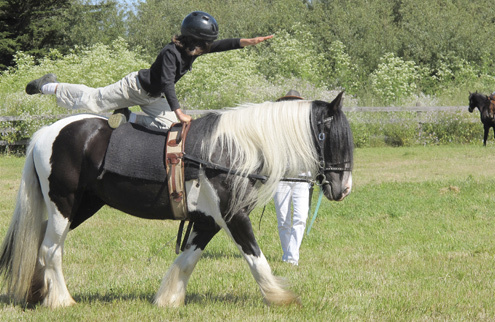 For example, you could fix desks, or make a yard for the kids to play in, or paint the walls. The Seminario students use the money that they have been saving up throughout the school year to pay for what they do. Her Seminario project is the second time this year Shaili (center) has helped solve housing problems for Guatemala’s impoverished residents. 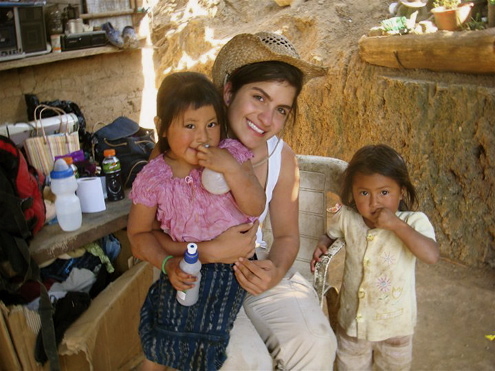 Last April, she volunteered with Un Techo Para Mi Pais (A Shelter for My Country) to upgrade the homes of indigenous villagers. “This year, the third phase [of the Seminario] was different because of Pacaya and Agatha,” Shaili wrote me this week. “The Ministry of Education let the whole grade work in a shelter instead of a school. We all went to a shelter near my school, and each group has been working on something different. “Twenty-three families are living in the shelter. They lost everything. My group divided off areas for each family by creating temporary walls, so they can have their privacy. Another group bought them cooking utensils. Another group made a chicken pen, and they will give these families chickens, so the families can sell the eggs and have some money. 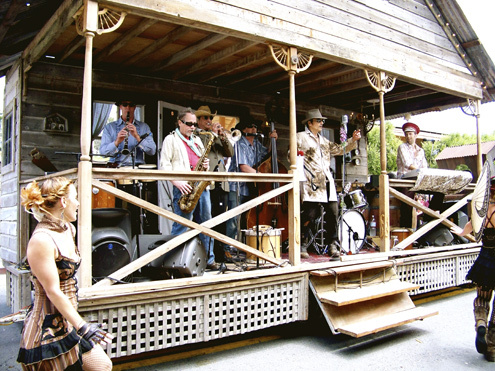 In preparing this posting, I was able to interview West Marin Citizen owner Joel Hack on the record, as well as Marin Media Institute vice chairman Mark Dowie briefly. Other MMI directors insisted on talking off the record. Corey Goodman, chairman of MMI, promised to make himself available for an in-depth interview Tuesday but stood me up. Much of the information here comes from a letter sent by MMI’s attorney to a bankruptcy trustee and from the trustee’s response. 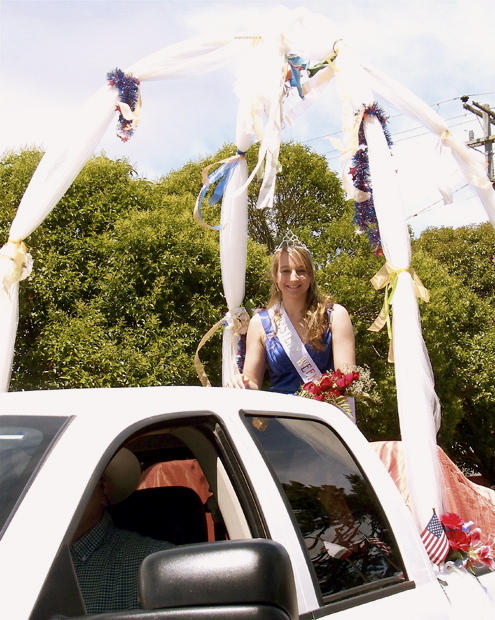 The ongoing dispute between The West Marin Citizen and Point Reyes Light has become remarkably bitter. 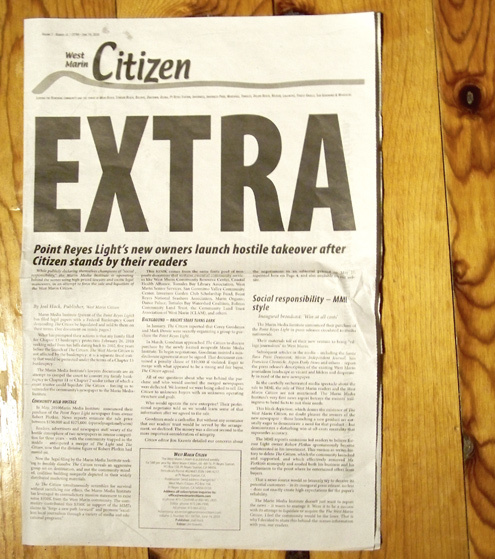 The Citizen on June 14 published an “extra” edition to announce the new owners of The Light have “launch[ed] a hostile takeover” because they could not buy The Citizen in a normal fashion. 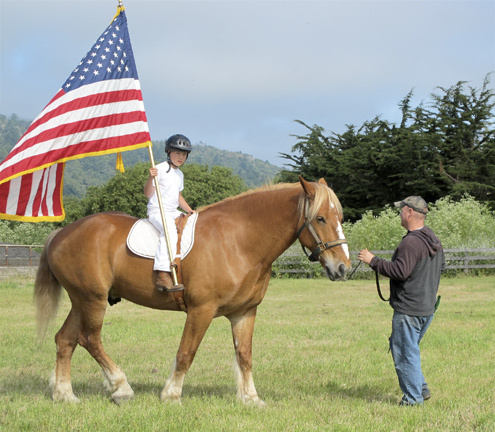 What’s occurred has surprised the staff and owner of The Citizen, as well as the staff of The Point Reyes Light and nearly all the directors of Marin Media Institute, the nonprofit which owns The Light. Here’s the story. 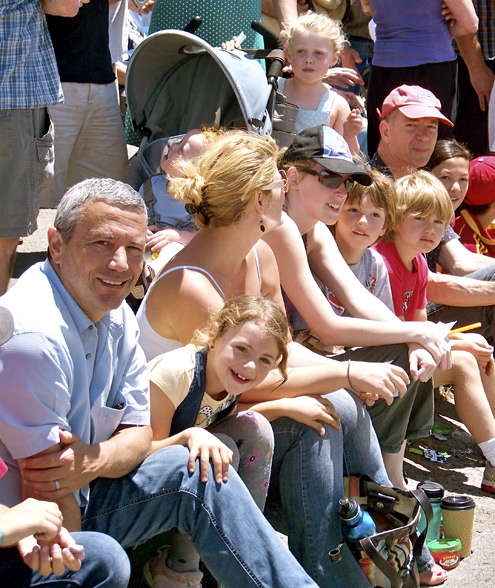 Citizen owner Joel Hack is married to Kathie Simmons, an attorney in Sonoma County. Kathie, who does business as a one-attorney law firm, had to dip into her IRA several times in recent years to cover business expenses. The problem, Joel told me, was that because she was under 59 and 1/2, she had to pay penalties for the early withdrawals. 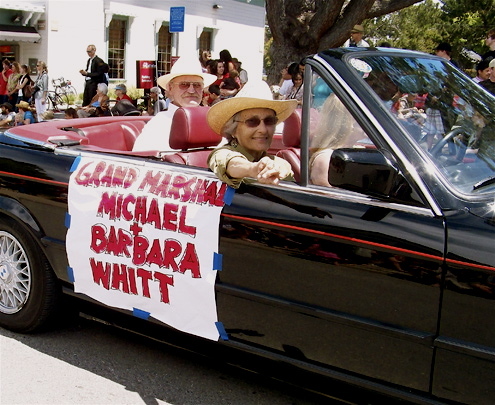 Without the funds to pay the penalties and failing to file some tax returns in a timely manner, the couple saw their initial debt of $4,000 to $5,000 to the IRS and the State Franchise Tax Board balloon to more than $20,000. On Feb. 26, Joel and Kathie filed for Chapter 13 protection (from creditors) under US Bankruptcy laws. They then began paying off their back state and federal income taxes at the rate of $600 a month. Under Chapter 13, they could do this for 36 months without incurring additional penalties. Meanwhile, Corey Goodman of Marshall and Mark Dowie of Inverness, who would later become the chairman and vice chairman of MMI, arranged for an appraiser to estimate the value of both The Light and The Citizen. Out of all this came MMI’s purchase of The Light but no agreement with The Citizen. In fact, it appears the two sides never came close although MMI and its attorney tell a different story. Initially both sides talked of a “merger,” but in the end it was clear that MMI wanted an acquisition. The staff and content of the two papers would not be merged; rather, The Citizen would be shut down. Joel, in turn, claims the personal bankruptcy was disclosed at the appropriate time during negotiations, and the bankruptcy trustee reports that Joel and his wife did, in fact, list all of their assets when they filed for Chapter 13. In essence, what they failed to do was place a value on three assets. 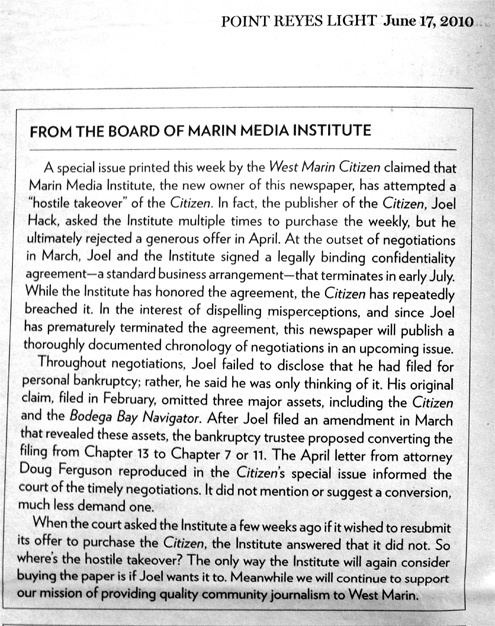 In their brief statement of June 17, MMI directors called their offer to Joel “generous.” Their attorney, Doug Ferguson, wrote the bankruptcy trustee that it amounted to “$50,000, all cash for all assets constituting The West Marin Citizen, with this amount payable $40,000 to Mr. Hack and $10,000 to fund severance payments to key employees including editor Jim Kravets…. As Joel sees the offer, it was hardly generous but ridiculously low. 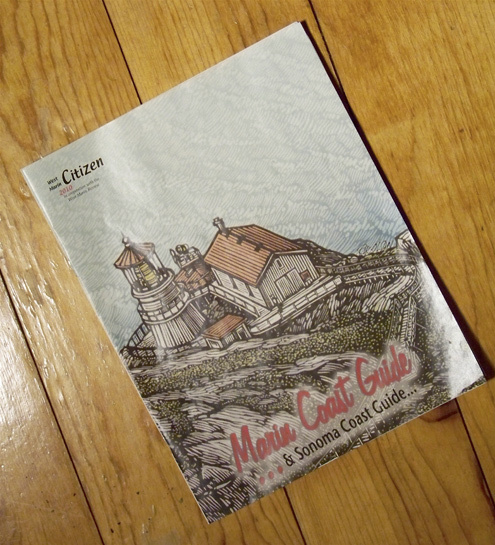 He said this week that at the time the offer was made, The Citizen had “good” accounts receivable of approximately $20,000 and had already sold $20,000 worth of ads for the next issue of The Citizen’s semi-annual Coast Guide, and would sell more. “By giving me $40,000,” Joel said sarcastically, “they’d be giving me my own money that I earned.” The Coast Guide alone is worth several times that amount, he added. In addition, Joel wanted to have a responsible position in a merged paper and for his daughter-in-law Shari-Faye Dell, who works for The Citizen, to get a job at The Light. Goodman rejected these conditions, and after a flurry of discussions, negotiations were dropped. Citing attorney Ferguson’s letter, however, the bankruptcy trustee this month recommended the bankruptcy court convert Joel’s and Kathie’s Chapter 13 (individual bankruptcy) to Chapter 7 (possible liquidation) or Chapter 11 (reorganization). 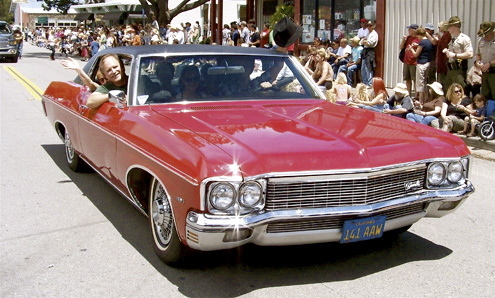 Trustee David Burchard also noted that although Joel and Kathie had listed The Citizen, the Bodega Bay Navigator website, and her law practice as assets, they hadn’t put a dollar value on them. Joel Hack in front of Toby’s Feed Barn. 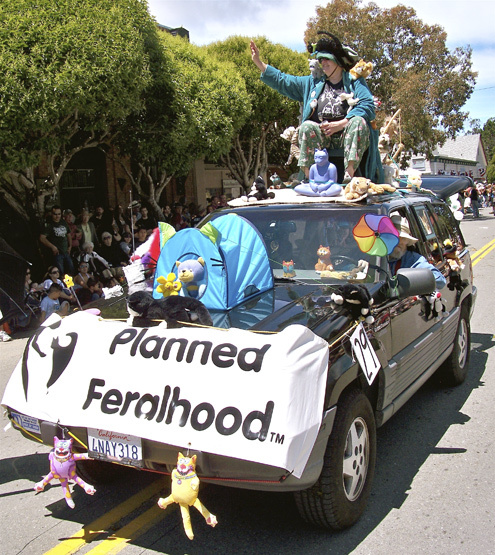 As for the Navigator website, which is rarely maintained, it has virtually no value, and it would be difficult to set a value on Kathie’s law practice if she were not a part of it. She has no major clients, and many of the small ones she does have would probably follow her to a new office. If Joel and Kathie had merely written “unknown” as the value of all three assets, it is unlikely the trustee would have paid much attention, he said. As it is, the trustee’s recommendation that the court convert their Chapter 13 to Chapter 7 or Chapter 11 has already cost Joel and Kathie money for legal fees, and more costs are coming. “It’s costing me an extra $20,000 at a minimum that I wouldn’t have had to pay if [MMI] hadn’t f-cked with my bankruptcy,” Joel grumbled. As for The Light, I’ve yet to find anyone on its staff or board of directors who — in hindsight — thinks Ferguson’s letter to the bankruptcy trustee has done the paper any good. 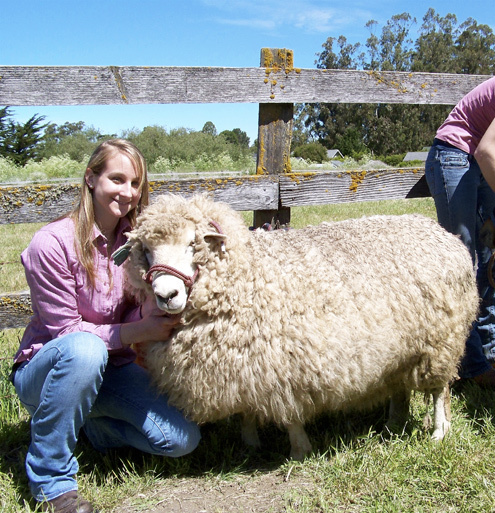 It’s needlessly given The Light a black eye and caused its staff to catch hell around Point Reyes Station. From what members of the MMI board tell me, most were unaware that Ferguson’s letter was being sent. Editor Tess Elliott, ad director/business manager Renée Shannon, and front-office manager Missy Patterson knew nothing about it, Mark said. If the public is going to blame anyone, he added, blame Corey and him, not the staff or the rest of the board. As for me, whom do I blame? Attorney Ferguson, who seems to have been too clever by half. While he did not explicitly ask the bankruptcy trustee to convert Joel’s and Kathie’s Chapter 13 bankruptcy to Chapter 7 or 11, he’s an experienced lawyer who should know how his letter could gratuitously muddle their personal finances. I assume Corey and Mark signed off on his sending the letter, but I doubt they were in as good a position as attorney Ferguson to foresee the problems inherent in his gambit. Those MMI directors who now defend attorney Ferguson say he was obligated to file a letter with the bankruptcy trustee because MMI was negotiating to buy an asset in bankruptcy. But it wasn’t. As Ferguson acknowledges in his letter, the negotiations had already been terminated. So why defend the attorney? Possibly because he was one of the donors when MMI was buying The Light. 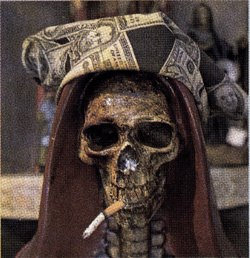 There’s a cult in Mexico with two million followers who worship Santa Muerte (Saint Death), The Economist reported last January. Describing a statue of her in a Mexico City sanctuary, the magazine noted it’s an “image of a skeleton, clad in hood and tunic and bearing a scythe and globe…. The piercing gaze of El Cadejo guarding an old debauchee? 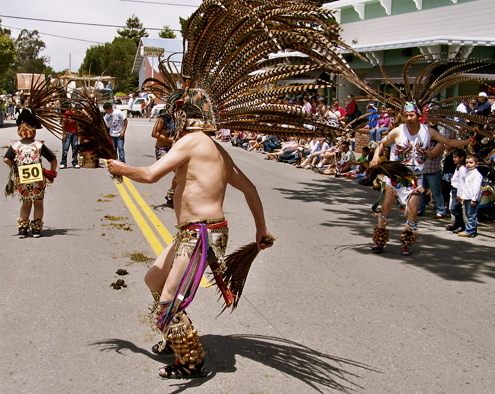 “Some Guatemalan folklore tells of a cadejo that guards drunks against anyone who tries to rob or hurt them,” Wikipedia agrees but adds that in other Central American countries and southern Mexico, “there is a good, white cadejo and an evil, black cadejo. I had forgotten about all this until what looked like a cadejo appeared on my deck Wednesday night. It certainly had the piercing gaze El Cadejo is supposed to have, but it didn’t look quite big enough. 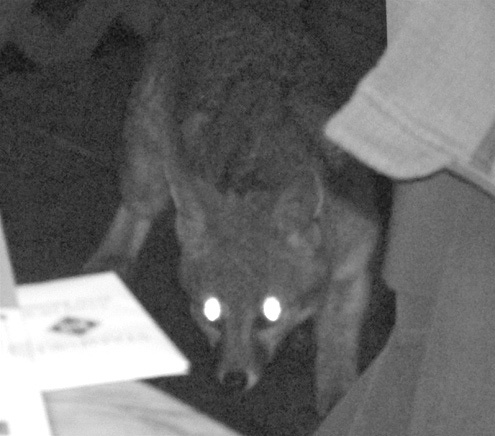 Before it disappeared, I managed to shoot a second photo of the creature, and my suspicions were confirmed: just a common gray fox, nothing as otherworldly as a black dog. 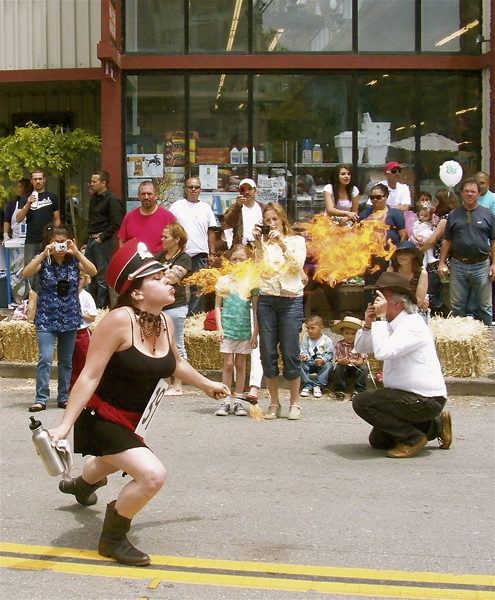 Meanwhile, West Marin’s newspaper wars are heating up again, with The West Marin Citizen accusing The Point Reyes Light of taking a Santa Muerte approach to competition. A report on that complicated matter will have to wait until next week. In our willingness to do anything to get a photograph, we wildlife photographers, like paparazzi, sometimes seem to have no shame. 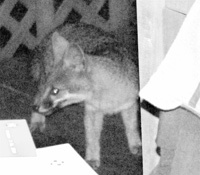 If you’d seen me on my deck in my shorts Friday snapping pictures of a coyote, I’m sure you would agree. As it happened, I’d spent the afternoon using a Weed Wacker to cut back grass along both sides of my driveway, which is about a tenth of a mile long. Needing to wash up after the work, I had taken a shower and was just starting to get dressed when I looked out my bedroom window and spotted a large coyote in the field below. Without pausing to pull on a shirt or trousers, I grabbed my camera and hurried outside as quietly as I could so as not to scare the critter away. 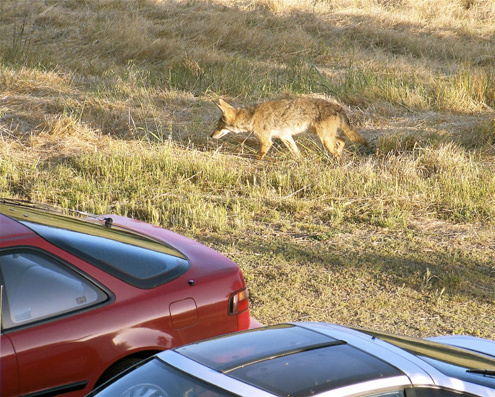 By now, the coyote had crossed my field and was nosing around near my parked cars. I wondered if it was sniffing around for this doe I’d spotted by my cars earlier. The coyote stuck around long enough for me to take its picture before it disappeared into a clump of (appropriately enough) coyote brush. As soon as it did, I called my neighbor Jay Haas about the sighting, and from his vantage point, he managed to spot the coyote too. 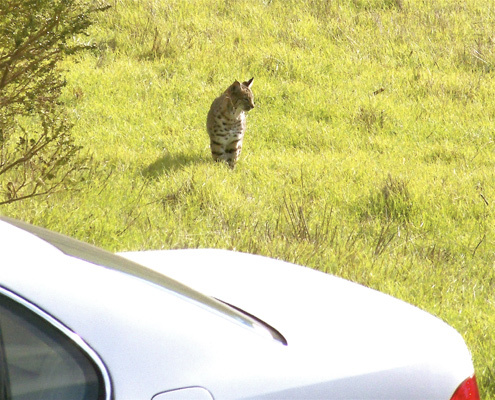 A bobcat wanders around a car belonging to two guests. 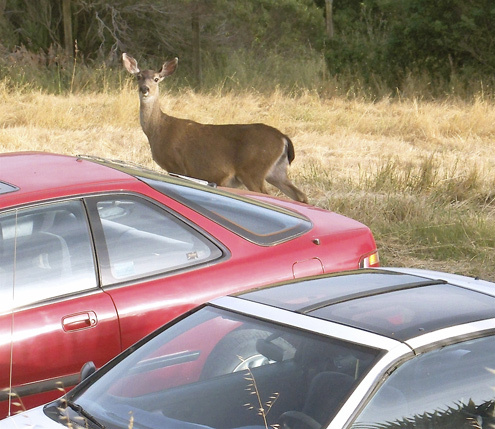 I don’t know what it is about my parking area, but it attracts wildlife as if it were a watering hole in the Serengeti Plain. I’ve been able to photograph both predators and prey hanging around my cars — coyotes and deer, bobcats and rabbits — as well as wild turkeys, great blue herons, and countless other birds. 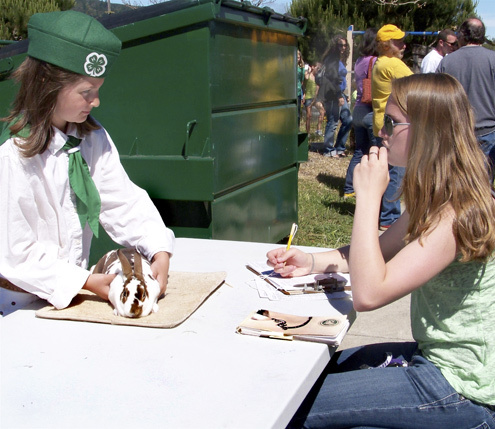 A brush rabbit, also known as a cottontail. Near the bottom of my driveway is the top of my neighbors Skip and Renée Shannon’s driveway, and they have their own ecosystem of squirrels, crows, hawks, and owls. 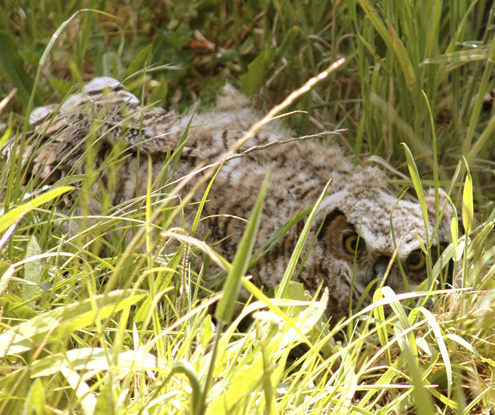 Renée, who is the business manager and ad director for The Point Reyes Light, last month told me Skip had been outside when a young great-horned owl fluttered down from a pine tree and landed in the grass. Skip quickly called to Renée to get her camera, and she was able to photograph the bird before it managed to fly a short distance and land on a woodpile. 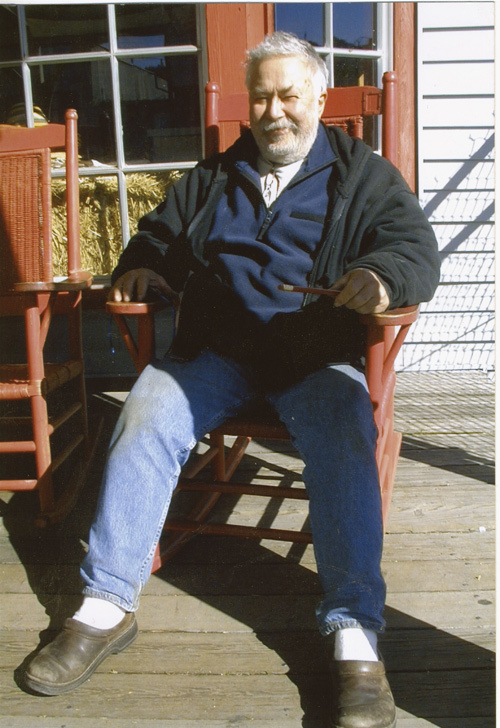 Renée then phoned ornithologist Jules Evens of Point Reyes Station, and he caught the fledging owl and took it with him to a Tomales Bay Watershed Council meeting in the National Seashore. 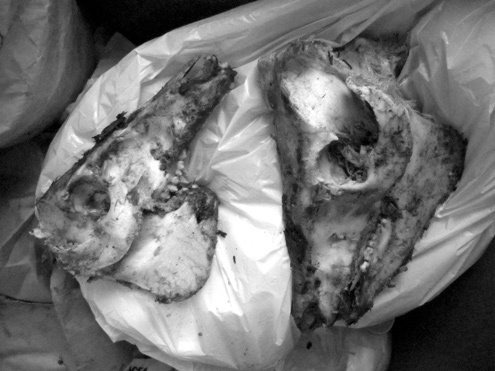 My story took an odd turn a week ago when Renée’s counterpart at The West Marin Citizen, Linda Petersen of Point Reyes Station, discovered two animal skulls on the ground between her garbage cans and back fence. 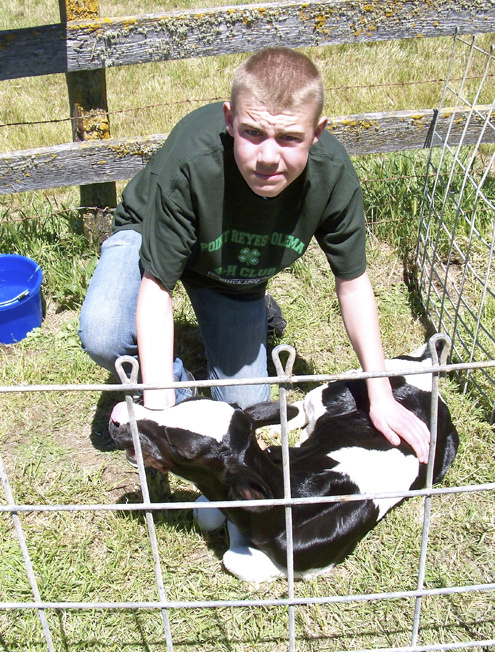 The immediate question was: what kind of animal? Linda checked skull photos online and decided they looked like pig skulls. I emailed photos of the skulls to Jules and to Chileno Valley rancher Mike Gale, and both agreed Linda was probably right. “They appear to be medium-size porkers,” Mike wrote back. That, however, doesn’t explain how the skulls ended up on the ground between Linda’s garbage cans and back fence. 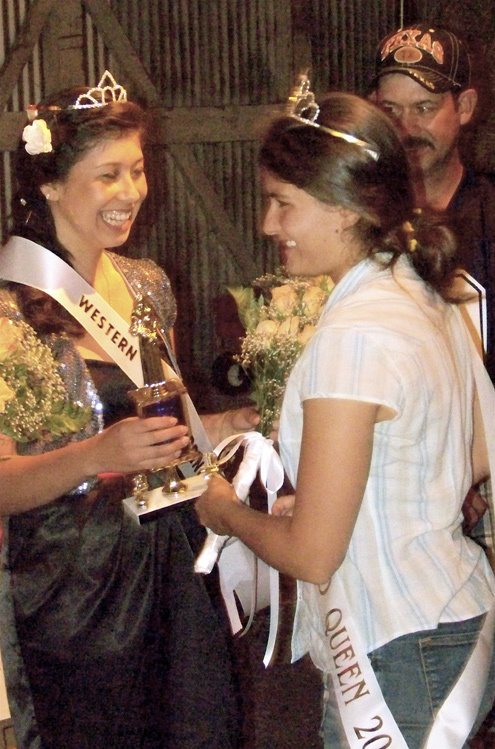 Did someone hold a luau and chuck pig heads over her fence? “Pretty rude of someone to toss them into her yard, eh?” Jules mused. 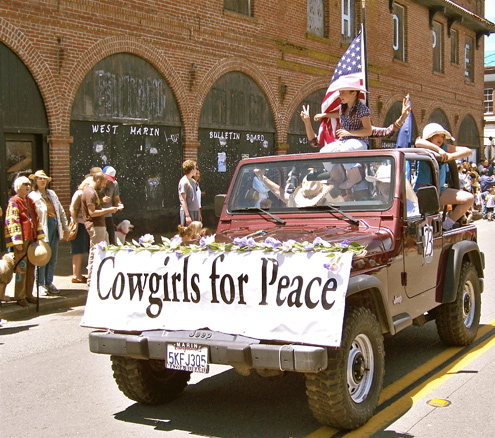 No score and seven years ago this Western Weekend, West Marin found itself on the alert for an intimidating presence it hadn’t faced since the time of the Civil War. On May 25, 2003, the first bear to roam these hills in more than 130 years was spotted at the hostel off Limantour Road in the Point Reyes National Seashore. Awakened about 4:30 a.m., hostel manager Bob Baez and assistant manager Greg King found a medium-sized black bear rummaging through a compost bin and pulling trash out of a Dumpster. They watched for about five minutes until the bear wandered off into the brush. 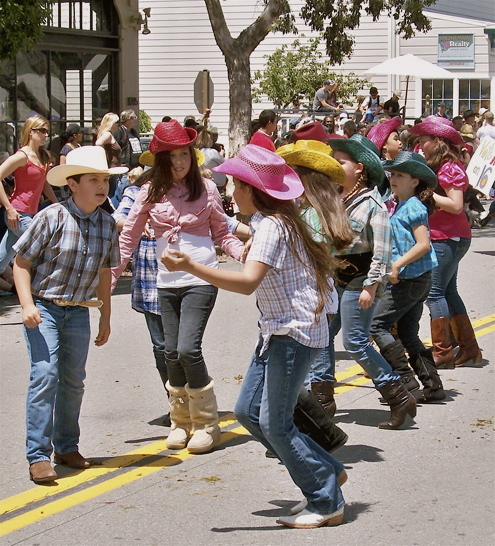 Although Bear Valley in Olema took its name from the abundance of bears that once were found there, Marin County’s last black bears had been trapped and hunted to death by 1869. In Occidental 40 miles to the north, however, a sloth of black bears had survived. (Odd as it sounds, ‘sloth’ really is the word for a group of bears.) National Seashore rangers assumed the bear at the hostel had wandered south from his sloth in Sonoma County. This time of year is the mating season for bears, and rangers suspected he was a young male that had been forced to seek new territory when an older male drove him off. Other reports came in of the bear raiding bird feeders and residential garbage bins around Inverness Park, but soon he headed south. On May 29 and 30, state park rangers spotted the bear on Mount Tamalpais. 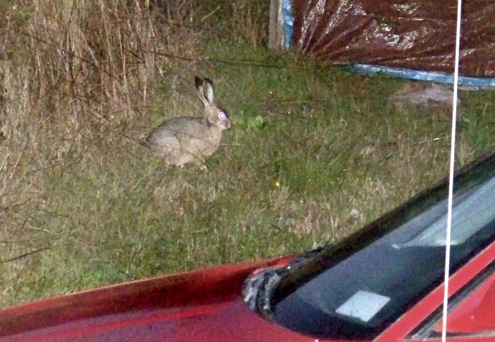 He then showed up in the Golden Gate National Recreation Area. On May 31, four campers at Kirby Cove near the Golden Gate Bridge watched as the bear rummaged through their campsite and dragged away food. 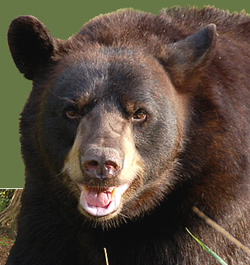 Historically, the “black bears” (ursus americanus) in Marin County ranged from brown to black in actual color. At 4:30 a.m. June 1, two long-time residents of the Zen Center in Muir Beach spotted the bear sitting atop a Dumpster. They hadn’t heard about the bear being in the area and could hardly believe what they were seeing. Evidence of the bear was then found in Muir Woods National Monument, where a maintenance worker discovered several of the park’s 50-gallon garbage cans “destroyed beyond use,” the GGNRA reported. 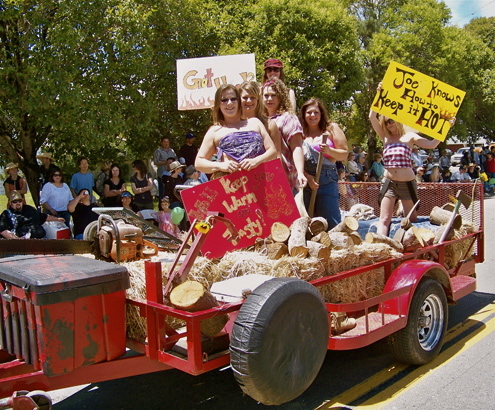 Officials of the GGNRA, Marin Municipal Water District, and the California Department of Fish and Game began asking residents of areas where the bear had been spotted to store their garbage inside. If it became accustomed to foraging in household garbage, they warned, the bear could become dangerous and would have to be killed. Fortunately, that did not happen. As mysteriously as it had arrived, the bear disappeared without a trace, and everyone agreed it had probably gone home to Occidental, which is known for hearty dining. 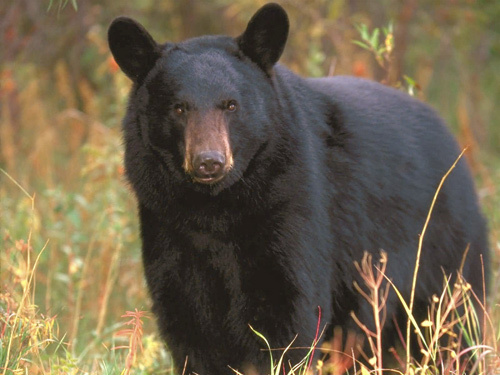 Black bears are fond of grasses, roots, berries, and insects. They also have an appetite for fish and mammals, including carrion, and are quick to develop a taste for human food and garbage. Or so say the experts. Sparsely Sage and Timely is powered by	WordPress 4.9.10 and delivered to you in 1.141 seconds using 54 queries.